These 2 volume books strive to provide to our readers the most up-to-date core information available in the published literature as well as our yet to be published studies with ample illustrations (total 416) on biodegradable polymers. Much of the information used in this book is from the authors’ own research activities over the past several decades. These 2 volume books contain a compilation of new developments in the creation and use of biodegradable polymers including the relatively new polymers designed from the ground up (i.e., designing new monomers), the modification of existing biodegradable polymers to achieve particular new goals and functions, new fabrication methods for better efficiency, purity and yields, new engineering methods to formulate existing biodegradable polymers into new physical forms, and new applications of existing or new biodegradable polymers in biomedical and environmental arenas. These 2 volume books contain a total of 28 chapters grouped under 2 volumes. Volume 1 has a total of 14 chapters and 2 sections: Section I Basic degradation study and phenomenon (6 chapters), and Section II Biomedical and environmental applications (8 chapters). Volume 2 has also 14 chapters, and focuses on newly designed biodegradable polymers, and their formulation into different physical forms. The chapters in both volumes have both new original articles and information and review articles with updated and new information. Although the bulk of the chapters in this book (> 90%) deal with issues in biomedical fields which are far more challenging, demanding, and costly to resolve, two chapters deal with use of biodegradable materials for environmental impacts. The books are designed for material and polymer scientists and engineers and biomedical engineers in both universities and in industries with an interest in the biomedical field. 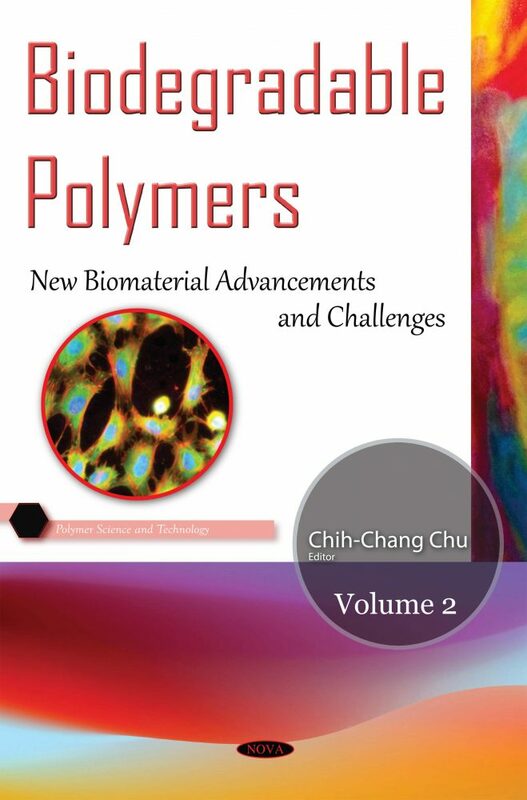 Biomaterial scientists and engineers, biomedical engineers and even medical professionals who have used implantable polymeric-based medical devices for their practice will find these books coverage of the latest developments and challenges useful either as a comprehensive review or an up to date report of the developments in the field of biodegradable polymers. The contributors include both academic scientists and research scientists in industry, from 10 different countries in North (USA) and South America (Brazil, Argentina), Asia (China, Korea, Singapore) and Europe (Germany, Italy, Spain, Portugal). Therefore, these 2 volume books are truly internationally as well as multidisciplinary-oriented, covering science and engineering without borders.